I <3 Miró. I first fell in love with him when I was in London, standing in one of the many rooms of Tate Modern, gazing at Message d’ami (Message from a friend). I was immediately smitten. What started as an attempt to get acquainted with modern art (I used to be a tad scathing about modern art movement) became a day of exploration and unspoken connection. That day, I learned a true lesson in the beauty of keeping an open mind and giving things a try. At least once. 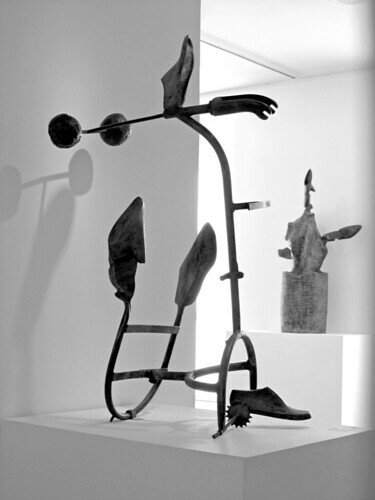 At Musée Maillol, an exhibition of Miró’s sculptures is currently taking place and it is so good to see the familiar elements of his paintings also reflected in the sculptures. The one thing missing is the bold colour blocks, given most of the sculptures were casted in bronze and not cured in any other way. I miss those vibrant colours. There are a couple of coloured preparatory sketches in exhibition, along with 2-3 paintings proper, but that’s too few for my liking. In writing this blog post, I discovered that another Miró exhibition is currently running in Tate Modern, which assembles paintings from public and private collection (what a coup!). I need to now find some free time to Eurostar myself over to London. Oh where in my calendar can I fit this in…?